God is a holy Trinity. A Trinity consubstantial and indivisible. Consubstantial, that is, one essence, one nature. A Trinity indivisible: the Son has never been divided from the Father, nor the Holy Spirit from the Father or the Son, and never will be divided. The Father, Son, and Holy Spirit are not three gods, but one God, since They have one nature. But not only because of this. People also have one nature, one essence. But with people one cannot say that two or three persons are one person, no matter how close and amicable they may be. People not only have separate bodies, but each one also has his own will, his own tastes, his own moods. No matter how similar people may be in body and character, it still never happens that everything is in common or that everything is the same. 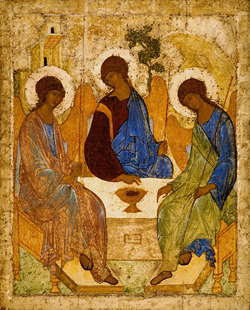 With the Three Persons of the Holy Trinity everything is in common. The boundless love of the Father for the Son, of the Son for the Father, and the same love between them and the Holy Spirit make Their will and all of Their actions to be common. They have one will, and everything is performed by Them together. Whatever pleases the Father also pleases the Son and the Holy Spirit. Whatever displeases the Holy Spirit also displeases the Father. Whatever the Son loves, the Father and the Holy Spirit love also. Everything is accomplished jointly by the Holy Trinity. At the creation of the world it says in the Bible: And God said, Let there be light: and there was light (Gen. 1:3). What does “said” mean? It means that God the Father created by His Word, by that Word of which the Gospel says, In the beginning was the Word, and the Word was with God, and the Word was God (John 1:1) and which is the Only-begotten Son of God. God the Father created everything by His Word; in other words, He accomplished everything through His Son. The Father does not create anything without the Son, just as the Son does not create anything without the Father, and the Holy Spirit always assists the Father and the Son. It is said in the Bible about the creation of the world: And the Spirit of God moved over the waters (Gen. 1:2). It “moved” over creation, but did not merely move over it—the word in the Hebrew original, which lacks an exact equivalent in Slavonic, signifies “to cover,” “to warm,” just as a brood-hen sitting on her eggs gives life to them by her warmth, and from them come forth living creatures. By the Word of the Lord were the heavens established, and all the might of them by the Spirit of His mouth (Ps. 32:6). All that exists was created by God the Father through the Son and was brought to life by the Holy Spirit. In other words, everything the Father wanted or wants, immediately was or is fulfilled by the Son and is animated by the Holy Spirit. Thus was the world created, thus was all accomplished by the providence of God concerning the world and mankind. In order to save man, who through sin had fallen away from God and became mortal, the Son of God, in accordance with the pre-eternal counsel of the Holy Trinity, obeying the will of the Father, came down to earth, was born of the Ever-Virgin Mary through the action of the Holy Spirit, proclaimed to the people the True God the Father and His Divine will, and taught the true worship of God. Having suffered for our sins, He descended in soul into hades, and, having freed the souls of the dead, He rose from the dead. Even before His sufferings, Christ promised His Apostles, chosen by Him from among His disciples, to give them the power to loose and to bind—to remit people’s sins or to leave them in their sins. After His Resurrection the Lord bestowed this gift of Grace not on any of the Apostles separately, but on all of them together: He established His Church, the repository of that Grace, and united in her all those who believe in Him and love Him. Having promised His Apostles that He would invest them with power from on high, having sent them the Holy Spirit, and having accomplished all for which He came to earth, the Lord Jesus Christ ascended to Heaven, receiving in His humanity that glory and honor which He had as the Son of God since before the creation of the world. In descending upon the disciples of Christ, according to the promise, the Holy Spirit confirmed them in the faith of Christ and through His Grace poured out upon them the gifts of God. He strengthened them for the preaching and fulfilment in life of Christ’s teachings, for the building up of the Church established by Christ and put into action by the Holy Spirit. The Church, standing on her foundation on earth and headed by the Son of God seated at the right hand of the Father, is mysteriously guided by the Holy Spirit. She inwardly links together all of her children and unites them with God. Through the Church, God’s gifts of Grace are poured out on those striving to follow the way of Christ; they sanctify and fortify all good in them, and cleanse them from sin and every defilement, making them able to become receptacles of the radiance of the glory and power of God. Through the Church man is made a partaker of the Divine nature, and he enters into the closest relationship with the Holy Trinity. Not only the soul, but also man’s body is sanctified and communes with God by partaking of the Body and Blood of Christ, through which he is united with the entire Holy Trinity. 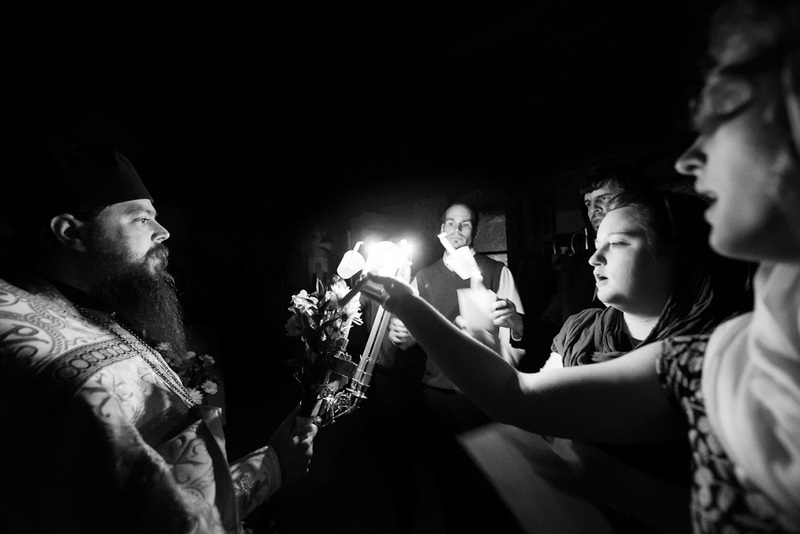 Through Divine Grace, with the participation of his own will and effort, man becomes a new creature, a participant in the eternal Kingdom of God. Nature, too, is being prepared for the coming Kingdom of God, for the coming purification by fire of the consequences of man’s sin and the curse that lies on her. She receives the first fruits of sanctification through the descent of the Holy Spirit on her at Theophany in the blessing of the waters and in many other Church rites, so that she may later become a new earth and a new heaven. This will be accomplished at the time appointed by God the Father, and the Son of God will come in glory to pronounce judgment on the world. Then those who have loved God and have been united with Him will shine with the rays of Divine light and will eternally delight in the uncreated light of the Triune Godhead of the Consubstantial, Life-creating, and Indivisible Trinity. “Come, O ye people, let us worship the Godhead in Three Hypostases: the Son in the Father, with the Holy Spirit; for the Father timelessly begat the Son Who is Co-ever-existing and Coenthroned, and the Holy Spirit was in the Father, glorified together with the Son; One Might, One Essence, One Godhead. In worshipping Whom let us all say: O Holy God, Who madest all things by the Son, through the cooperation of the Holy Spirit; Holy Mighty, through Whom we have known the Father, and through Whom the Holy Spirit came into the world; Holy Immortal, the Comforting Spirit, Who proceedest from the Father, and restest in the Son: O Holy Trinity, glory be to Thee” (Dogmaticon of Great Vespers of Pentecost). We know that prayer in and of itself cannot save us, but carrying it out before God can. For when the Lord’s eyes are upon us He sanctifies us, as the sun warms everything upon which it shines.